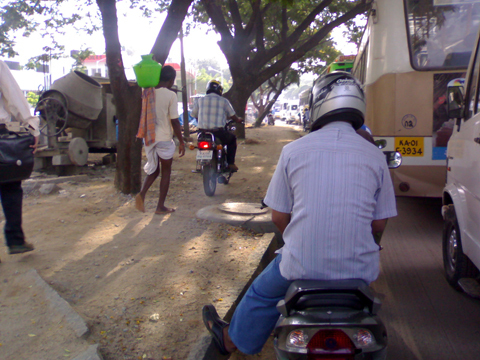 Here two-wheelers invade a footpath. All photos by Sudhir Gota, SECON Pvt Ltd.
Krishnappa is a security guard for a multinational software firm in Bangalore who, for the past thirty years, has walked and cycled to work. For Krishnappa, the trip, which often took around 15 to 30 minutes, was one of life’s small pleasures as he made his way along Bangalore’s tree-shaded streets, often meeting friends and acquaintances, discussing politics and family matters, before continuing on his way. However, in recent years he has been unable to walk or cycle to work. And it’s not because of age or injury. When asked about his transport woes, he blames the government. The increase in land prices, lack of cycle tracks, footpaths, poor public transportation, and the risk of being struck by a motorized vehicle have forced him to drive to work. He now spends nearly 30% of his salary on his monthly commute. Krishnappa is not alone. Rapidly growing Bangalore city has generated a new human species aptly named “Transport Challenged People.” The common trait of these people is that they are forced to become captive to a mode of transport just because they don’t have an accessible alternative. Their other characteristic is that they pay a price for traveling that they do not consider fair or just, but because they have no other option, they continue to pay it. It’s on the peripheries where the transport woes reach their nadir. The rapid change of this region from agricultural to mixed use was haphazard; traditional rural roads catering to village traffic became mixed with urban traffic, choking the roads and restricting public transportation. 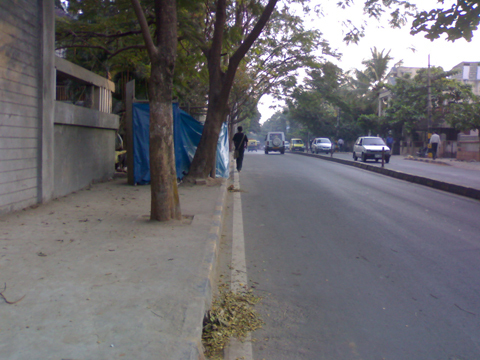 The government, in order to solve “MOBILITY” needs, started transforming the available footpaths and shoulders into roads. It also converted two-way roads to one-way roads and created elevated roads when there wasn’t enough space on the ground. 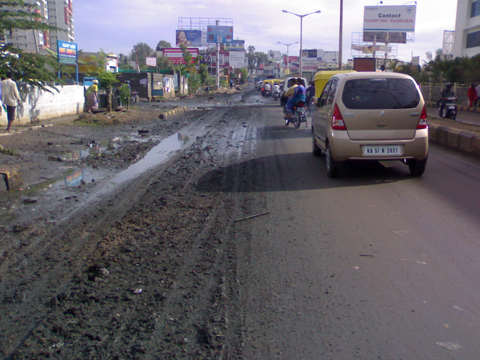 In fact, Bangalore roads make up nearly 85 square kilometers of the city. That’s not a small number; the land value of these road is approximately $47 billion! 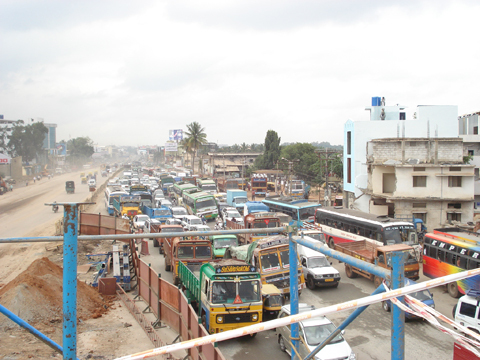 Bangalore’s urban sprawl was aided by the economic boom, during which income levels of certain industries skyrocketed. The rising income combined with long travel times, poor public transportation facilities and the glamor and hype generated by the automobile industry powered the vehicular boom on the roads. The government’s efforts to make the city more car-friendly had a boomerang effect with a virtual multiplication of private automobiles on the road. In fact, the motorization index nearly doubled from 178 in 1996 to 361 in 2006. Presently, private automobiles – two wheelers, cars, taxis etc. 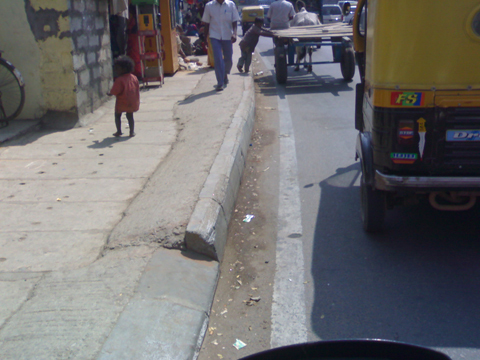 – make up nearly 88% of the vehicles on Bangalore’s streets. Yet that accounts for just 39% of trips. Thus it can be concluded that Bangalore has high congestion not because it lacks roads– a claim that advocates of road construction routinely make – but because there are so many private vehicles moving so few people. The issue of Transport Challenged People cuts to the heart of the city’s well-being. That’s because nearly 40% of households don’t own any private automobiles and are completely dependent on walking, cycling and mass transportation for moving around the city. But these people, especially pedestrians, are rarely if ever considered by transport planners. The result is a lack of proper walking infrastructure which forces pedestrians to compete with motorists for a slice of the road, increasing their odds of being struck by a motor vehicle. Although Bangalore has nearly 477,853 bicycles, cycling makes ups less than 15% of operational trips because there is no place on the roads for cyclists to ride. It’s important to point out that nearly 50% of households have a salary of approximately $123.6 per month. The percentage of expenses on transportation is around 24% of household income. If an individual like Krishnappa, due to lack of adequate facilities such as footpaths, cycle tracks and buses, unwillingly drives to work, then he would spend nearly $22.25 per month for his transportation alone. When a poor household starts spending such a high amount of money on transportation, its overall quality of life severely deteriorates because it can no longer afford things that it could otherwise buy. And these are not trivial things; they can be basic health care and schooling. With rising costs of energy – Bangalore has the highest petrol prices in India – and stagnant income levels, these people have no way of escaping transportation induced problems. 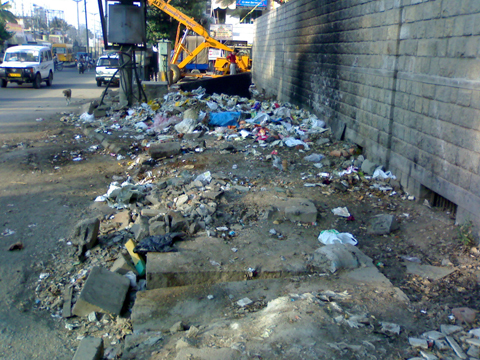 At stake here is the type of city that we want Bangalore to become. So far, rapid motorization has converted Bangalore from a garden city to a black city – nearly 800 people die on Bangalore’s roads every year. And approximately 40% of these fatalities involve pedestrians and cyclists. The woes of such transport challenged people will continue unless the government begins to address their needs and concerns. It’s time to start planning for people and not vehicles. 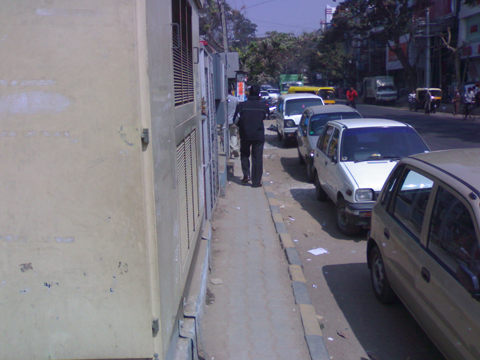 Accessibility and not mobility should be the primary concern of the planners and government. 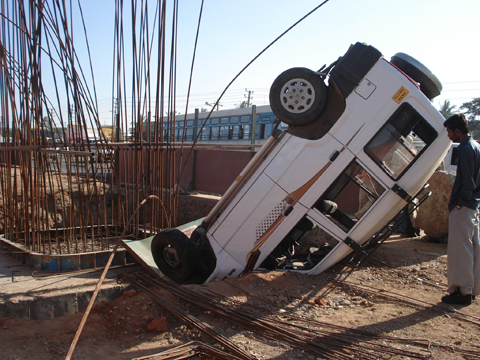 People like Krishnappa, who are the victims of rapid motorization, demand an explanation. For a more thorough discussion, please click here.